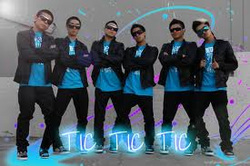 Poreotics, also known as Poreotix, is an American all-male dance crew from Westminster, California. The crew was formed in 2007 by "Dumbo" Nguyen and specializes in popping, choreography and robotics, hence the name Po-reo-tics. They have performed in numerous hip hop dance competitions, most notably coming in 1st place in the USA division of the 2009 and 2010 Hip-Hop Internationals and in other dance programs and competitions including the Vibe 15, FUSION X, Body Rock, and World Of Dance. On April 8, 2010, they were crowned the champions on the fifth season of America's Best Dance Crew. On January 14, 2011 they were crowned as Team of the Year at the World of Dance awards. They are known for their shaded, dark glasses which they wear for all of their performances. Jet Li stated that they wear the shades because it gives them character. All of them are of Southeast Asian heritage. Matthew "Dumbo" Nguyen, Can Nguyen, and Charles Nguyen are Vietnamese while Chad Mayate, Lawrence Devera, and Justin "Jet Li" Valles are Filipino. Poreotics was formed in Westminster, California by Matt "Dumbo" Nguyen, Can Nguyen, and Charles Nguyen in December 2007. Supposedly, Dumbo met Can at a movie theater and battled his brother. Can Nguyen attended Garden Grove High School. Subsequently the group expanded with new members Lawrence "Law" Devera and Justin "Jet-Li" Valles. In 2009, the team chose Andrew Chad Mayate to substitute for Justin Valles in the 2009 Hip Hop Dance Championships. The team won first place and Chad Mayate became a permanent member. Five out of the six crew members (Dumbo, Can, Charles, Law, and Chad) were also members of PAC Modern Dance Troupe. In 2008, both Matt (Dumbo) and Lawrence (Law) competed on Season 3 of America's Got Talent with the crew Sick Step.